Even before the Stones' first show in Peru, Lima had already impressed me as the friendliest, most enjoyable city so far on the itinerary. 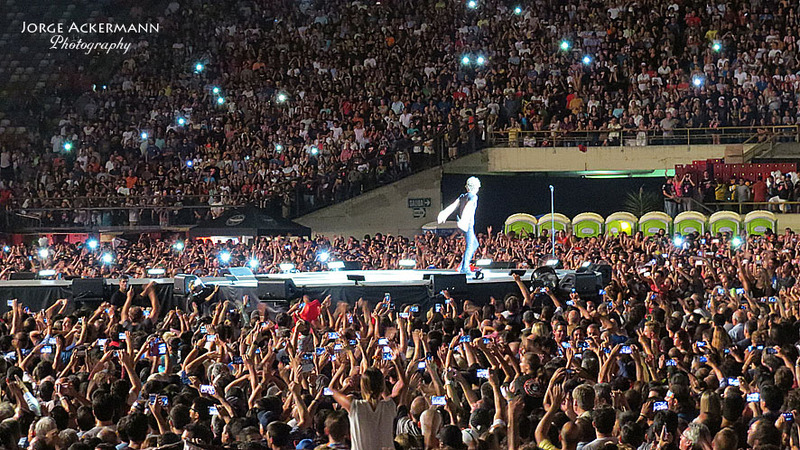 And the good vibes carried over to Sunday's show at Estadio Monumental, which seemed to be halfway to Ecuador. The stadium is set against a mountainous backdrop reminiscent of Tempe or El Paso. And the interior is subterranean, like the football field the Stones played last year in North Carolina (or was it Kansas City?). A huge makeshift village of food and souvenir vendors greeted fans long before they reached the venue, and the aromatic smells hung in the balmy air. Riot police were everywhere. They don't take chances in this country. Given the exorbitant ticket prices in a country where the average monthly wage is the equivalent of about US$500, I was shocked to see such a huge and diverse turnout. It seemed everyone was wearing a Stones concert t-shirt. I didn't see any peasant women in bowler hats, though. A lot of people did get upgraded from the cheap seats behind a fence opposite the stage ($93) to closer seats along the sides ($400, $318). And the Golden Circle ($700) was packed. The Stones delivered a solid set, nothing risky. "Like A Rolling Stone" and "Angie" were rotated into the 18-song set, dashing my hope that "Emotional Rescue" would be the Internet choice. The audience seemed excited most of the time, if not exactly passionate. From my vantage point near the end of the catwalk, the inevitable lull caused by Keith's twofer lasted into "Midnight Rambler," which came in at just 14:28. 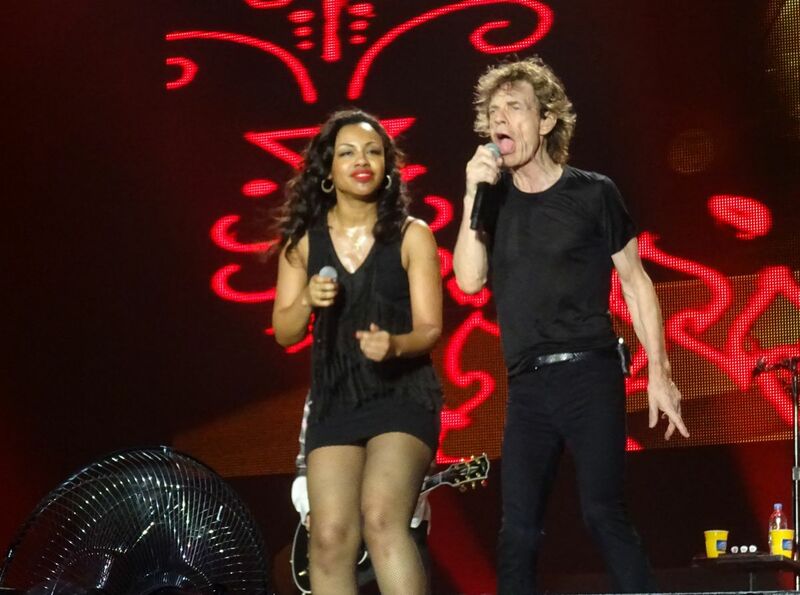 Things picked up with "Miss You" and everyone was impressed by Sasha's phlegmy "Gimme Shelter" spotlight (except me). I thought Keith seemed out of sorts during some of the early songs, including "Out of Control," and the bit where he purrs like a pussycat when Mick does his harp solo. No such fanboy behavior tonight. But he cheered up during "Like A Rolling Stone." 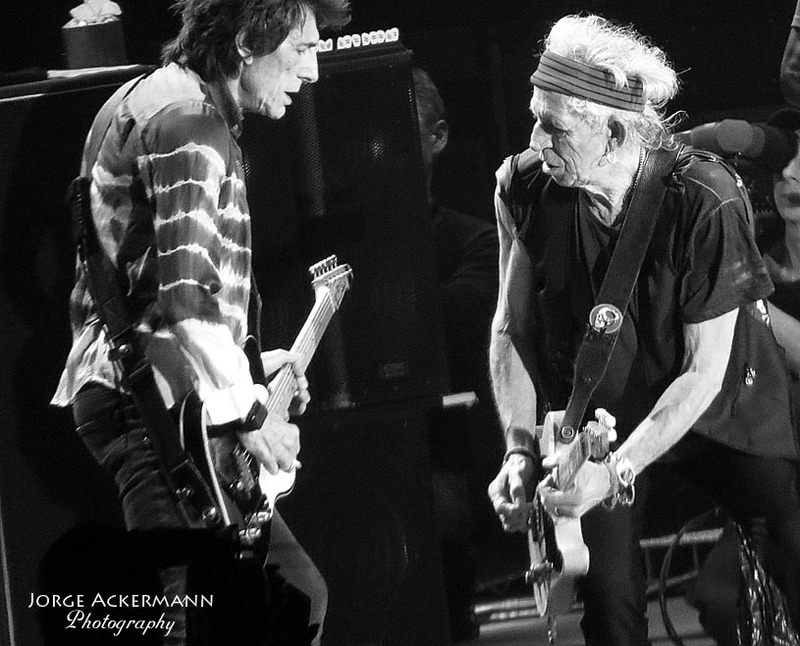 Maybe he was annoyed that Mick said "All right, Ronnie" before Keith's solo on "It's Only Rock 'n Roll." Before he began his two songs, Keith said, "It's great to be here at last. It's taken a while." 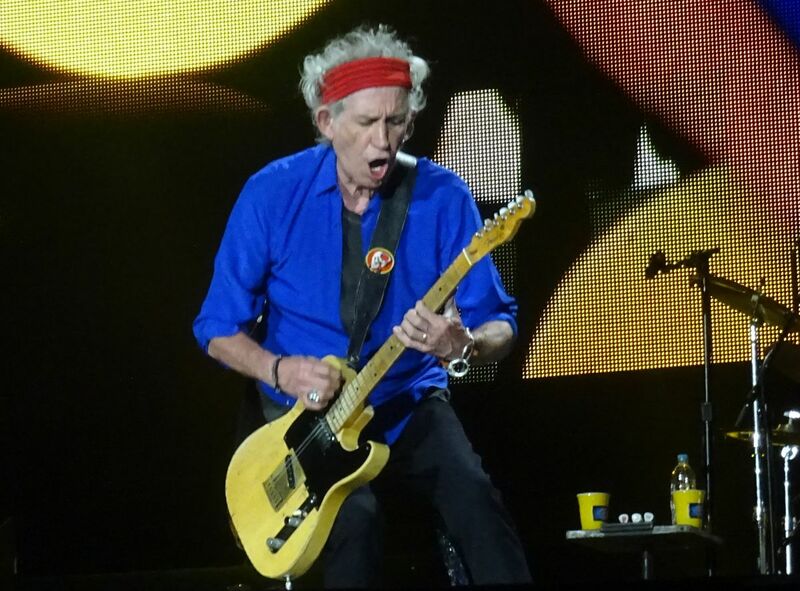 Of course, as Mick had already reminded the crowd (in Spanish), he and Keith visited Peru years ago. (I believe it was 1969). Mick later introduced Ronnie as "the llama lover of Lima," and now I can't get bestial images out of my mind. I couldn't make out his joke (in Spanish), but he mentioned a pet hamster - which is a popular food in Peru, roasted on a spit like chicken. Charlie, for once, did not wear the colors of the flag. His shirt was red, but his pants were dark. I don't know if he has a white pair. Overall, a fun show with historic value, and a good way to cap off a few days in a wonderful town. The city of Lima has been a joy during my four days stay here. I just love Lima, wish I could go back one day, but tonight it was show time. I went into my taxi at the Sheraton by 1:30pm, five minutes later we passed by the Westin, and in another twenty minutes I was at the stadium. The traffic on Sunday was a joy, no queues, not so much honking the horns. Everyone was cool, calm and collected. The early arrival gave me time to have some food before going into the stadium. I had an early-access ticket. We walked in at 3:30pm. The "Estadio Monumental" looked massive, almost like a fortress. With the dry hills backdrop, the barb wire, police by the numbers, and the grey concret look of the entire stadium, I had the sort of Alcatraz feeling. No easy escapes from this massive stadium. Once inside, I was excited to do the run for the front rail, but I settled by the rail to the center stage, five or six people in front of me by that rail, which means 2-3 meters, and a perfect non-obstructed view to the center stage. No need for the 30x zoom in my camera tonight. And I knew Mick, Keith and Ronnie used to stop often right where I was. And the pro photographers stayed there, Brian Rasic and the others working hard making great pictures for the fans to enjoy. When they took the set list photo they first took a few shots out by the B-stage, then from the stage, and finally in the front on our side, the Keith side. It was fun to be part of the set list photo, like in Santiago de Chile. Yes, it is me there at the right, by the rail, dark blue T-shirt, hand in the air. Great to have a souvenir from the show others than just the memories. The local fan to my right was Ferdando Rodriogues. He had seen the Stones in Washington 2013, so he was a true fan with experience. Next to him was his son age 13. 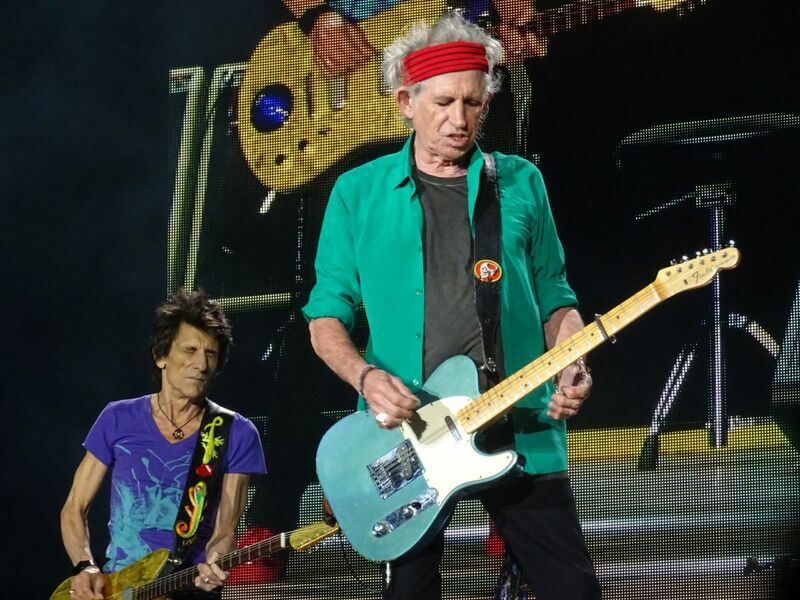 That is the perfect age for a debut at a Rolling Stones show. Ferdando was a great source of information when the local band "Fragil" entered the stage at 6:15pm. They are the most popular local Peru rock band of all times, not really together anymore, but they reunited tonight, with a younger singer. Then after some songs the original singer joined them. Great band, great warmup. Peru should be proud of the band "Fragil". After six hours waiting the Stones were on. The crowd went nuts, like fifty plus years of waiting was exploding into the air. Such a great version of "Start Me Up". Mick right in front of me half a dozen times, looking right into me at times, Ronnie there on the solo, I was in Stones heaven. My best friend from Lima, Jorge Ackermann, who had been so nice to show me his beautiful city, told me that his first song as a Stones fan was "Angie". My new buddy Fernando said the same, his favorite was Angie. I had been hearing Pierre prepare the acoustic guitar in the afternoon, and he did some riffs that had to be Angie variations, even if we were not supposed to figure that out. Well. We got Angie! First Keith did some fiddling with the acoustic, just to get his fingers running, I would say it sounded like "Play With Fire". But then he started "Angie". I loved it. And all the fans in the stadium loved it. I will dedicate this review to Jorge Ackermann from Lima. He is a true fan, and a very unique one. My friend Roy from Argentina told me about Jorge from Peru when I was in Argentina for the shows there in 1998, i.e. 18 years ago. Then Jorge took the bus three nights and three days all the way from Lima Peru via Chile, Santiago de Chile, and over the Andes to Buenos Aires, because he loves the Stones so much. And the same way back home, three more nights and days. Jorge never got Angie then, back in 1998 at River Plkate Stadium, but tonight they played "Angie". It was for you Jorge, thanks for showing me your city, it is fans like you who make it so great to be on tour with The Rolling Stones. Ronnie was presented by Mick as the "Lama lover from Peru". Charlie did the whole walk, because unlike Porto Alegre, where it rained, here he was safe up front taking the bow. With a smile. Then Keith got the biggest ovation. Mucho Gracias! The rest of the show was so strong. Keith was on fire. Mick was feeding the energy from the crowd into himself, running up and down, wing to wing, returning all the energy to us. Charlie did the double beats earlier in the show during "Paint It Black", and kept it steady ever since. Ronnie had his great moments on song after song. 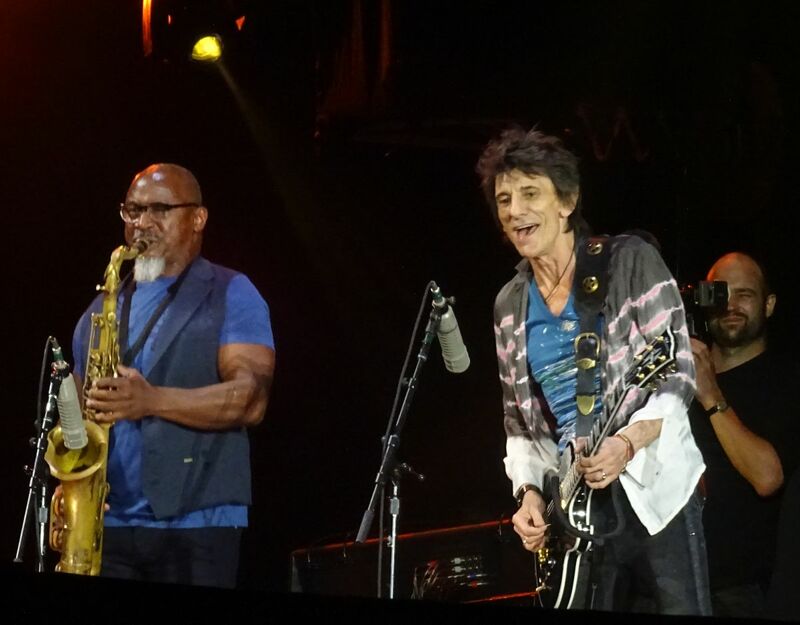 Usually Keith start "Brown Sugar" just a moment after "Sympathy For The Devil" is finishing. This time Mick had to do quite a few extra "yeah yeay", playing the crowd. I wondered what was holding up Keith, even if it was just a few seconds... Keith was busy tighting his shoelaces... But no worries, he was quick. Brown Sugar was so strong, like the rest of the show. The show in Lima was so great. The crowd was so great. Nobody cared or even bothered that the original Olé Tour stage was half way to Mexico or Cuba by now. Nobody cared that the side screens were half the size normal. Everybody cared about a great show. Lima, Stones, you did it, we did it! 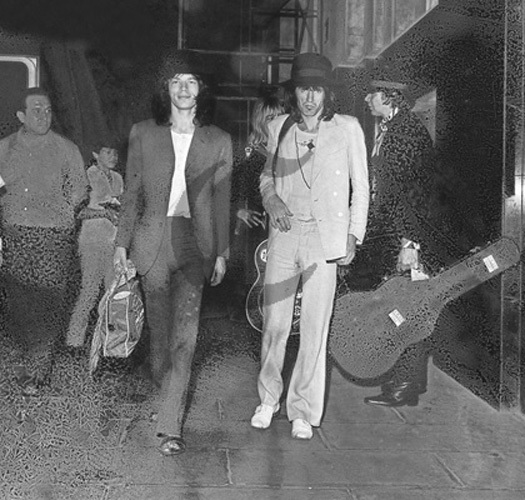 Mick and Keith were here in Perú in 1969, but only on holidays. Then Mick came again in the early ‘80s to be part of Werner Herzog’s movie ‘Fitzcarraldo’, but then he left the project (you can still see some of the footage that didn’t make it to the final version of the movie in Les Blank’s ‘Burden of Dreams, The Making of Fitzcarraldo) Then Mick was again in Peru in the early 2000’s, but no Stones playing. So last night the Peruvians finally got what they’d been waiting for say, for ages; their first concert ever in their country! Oh yes, Lima was waiting for it, you could sense it in the air. Huge press coverage and lots of fans waiting (and even trying to camp) outside the Westin, the hotel were the Stones were staying in, in the San Isidro district. I left for the concert about 5 pm with my dear friend Cucho Peñaloza, his wife Tomasita, and our friends Maryellen White and Michele Hassing. We took a taxi all the way to the huge Monumental Stadium (and yes, it’s a monster one!) By the time we arrived there was thousands of people waiting to get in, not to mention the people selling all kinds of Stones-related merchandise. Among the guests at the VIP area, we could see Jimmy Jagger (Mick’s son), who’s currently acting in the Vinyl TV series. 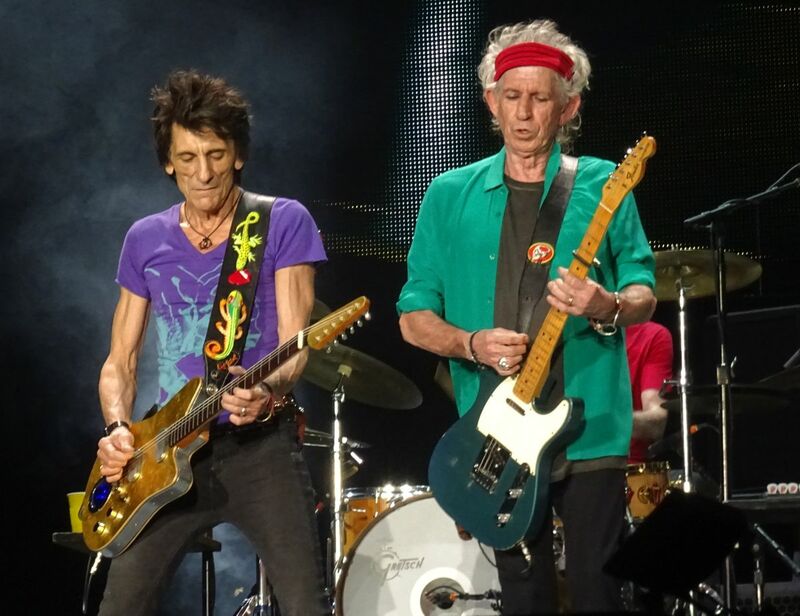 Show began at 9 pm, that’s when the Stones hit the stage to show the audience what they’ve been asking for centuries. ‘Vote’ song was Like A Rolling Stone, then followed by Angie, which seemed to be the most popular song of the setlist, as the crowd sang it all the way (somehow Keith screwed up during the intro, but then that’s also rock’n’roll, isn’t it?) As for the rest of the show, it seemed to me (and my friend Cucho also agreed afterwards), most of the audience didn’t know many of the songs, mainly the ones at the VIP/golden/pit area, even the biggest hits. And you could also see that by looking at the Stones’ faces. So it felt great when many of the people who had the most faraway seats got free access to the field area halfway through the concert, now those were the ones who were really into the band’s songs! Let’s also bear in mind Lima’s tickets were the most expensive ones of the tour, almost double-price if you compare them with the rest of the South American dates. So did Perú got Satisfaction? Oh yeah. A great show in a beautiful city in also beautiful country, what else could you ask for? Next stop is Bogotá in a few days on Thursday. Colombia, here we come! This time the concert was at home. I did not have to travel so many days to enjoy the shows as I did in Buenos Aires in 98 and Lima was witness of overwhelming music played for the best band in the world can join generations create life style of living and give and special atmosphera that could be great it never ends. The band sound amazing in this Olé tour what a show what a felling what a sensation on this day the 6th of March. Sunday Very early Lima smells Rolling Stones fragance people, cars were going to the east of the city which Monumental stadium which would take a place and unique and historic and urepeatable event. It is easy to see people from other countries neighbors countries The Stones won't play in some countries and its now or never people came to my country as I did in 98 when i traveled to Argentina I understood their emotion. The monumental stadium is the second most important stadium of the country this is a soccer stadium where "Universitario" team plays as local it's a giant concret building without running track so grandstand are closer to field and at the top of it has private suite loges. Its 4:30 and people entered inside the stadium the view is spectacular the stage is big but not as the one I saw in 1998 in "Bridges to Babylon tour" three big screens and a runway that almost touch the center of the field can give Stones fans a good view and to be very close to their idols. Hours passed and the place began to have more crow and at 7 PM local band “Fragil” one of the most important and traditional local band appeared on stage the sound was not good and few lights supported the show it's not easy to share the same stage with the most important band in the world an honor yes the band tried to do their best a really hard job cause people are waiting for other sounds but the members will say in future they shared the same stage in that historic night. Meanwhile in backstage “The Ballumbrosio family” a traditional Peruvian family Perfoming for Mick and the guys an Afro-Peruvian Tap Dancing performance by this family very known in Chincha south of Lima. 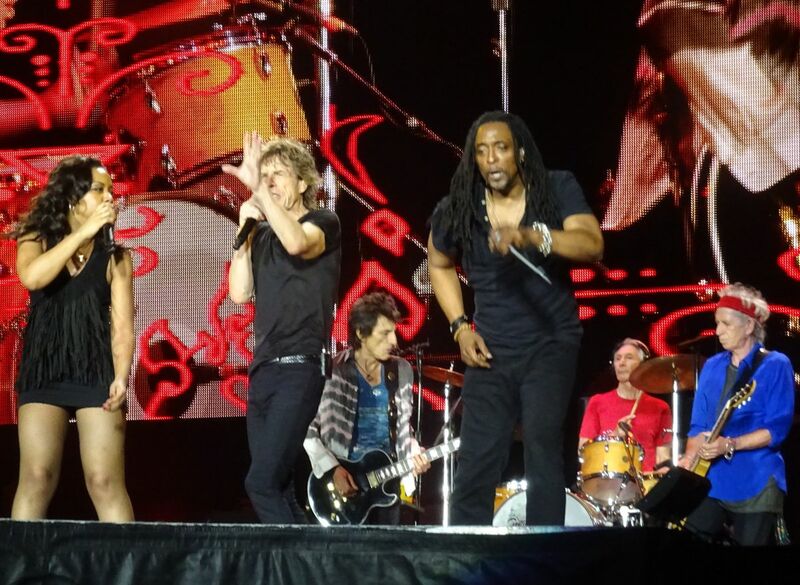 "Ladies and gentlemen The Rolling Stones!!! " The shouting is high and the first acords of "Start me up" began to sound then pyrotechnic people jumping and enjoying this magical moment music surrounded me and my body began to move and dance in auto mode. Mick used peruavianism phrases to get closed to peruvians "Hola amigos hola mis causitas" (hi my friends in a peruvian colloquial way) Mick spanish is not so bad he has a funny accent well after all he and the band have been many times in latin america and Mick his four time in Peru and the first with the band sure he knows our culture. The first time in 69 Mick and Keith were at Bolivar hotel this place is located in our historic center of the city and My good friend Bjornulf Vik visited with me to see the place and to drink our national "Pisco sour" a cocktail typical and created in Peru and Bjornulf approved it. The concert continue and people give their energy to the band we are not so effusive as argentine fans but the crowd had a good attitude the reason maybe is that much of the most important fans are in popular grandstand and they can't pay more closer to stage expensive tickets. The song required by people well I voted for "she is so cold" but "Like a rolling stone" was the song choosen good to hear again this song. In 98 I heard it two times and with Bob Dylan as a guest. The setlist continue and and Mick says to people in spanish "Here I can eat the best food in the world" is not a favor is really true peruvian restaurants are around the world and a good reason to come here and Mick the night before the show was tasting peruvian food at "Central" Lima Restaurant (The fourth best in the world according to “Restaurant ” a UK magazine) however he made a joke talking about his daughter he said she lost her hamster people laughed caused in peruvians mountains there is a peruvian food with "Cuy" maybe and old and bigger hamster relative but hamster are pets here too not for food. 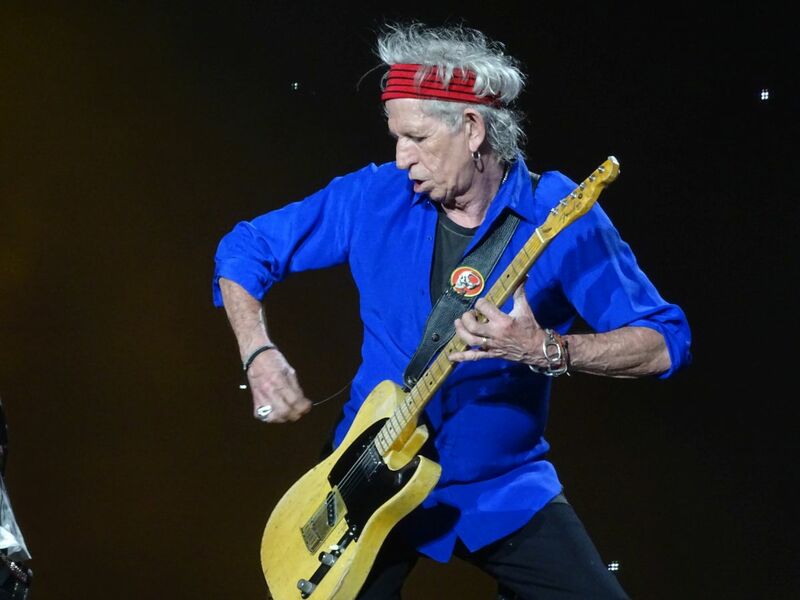 "Paint in black" "Honky town woman" songs continue then keith Richards with his Gipsy look and his face with lines as peruvian pre inca“ Nazca lines” gave us two songs "You got the silver" "Before they make me run". Encore then "can't always get" with choir nice musical piece and finally the acords of "Satisfaction" began with a reloaded version maybe the Stones more played song for the first time alive in Lima the end the band say good bye to the crows nothing in life is eternal Rolling Stones came for the first time to Peru and made true the dream of peruvians who loves their music many of us never tought to see them alive in the past when we were just childs when you wanted to hear a good band from UK or America the only chance were turned on the radio or buy a record to enjoy the best melodies of all times. 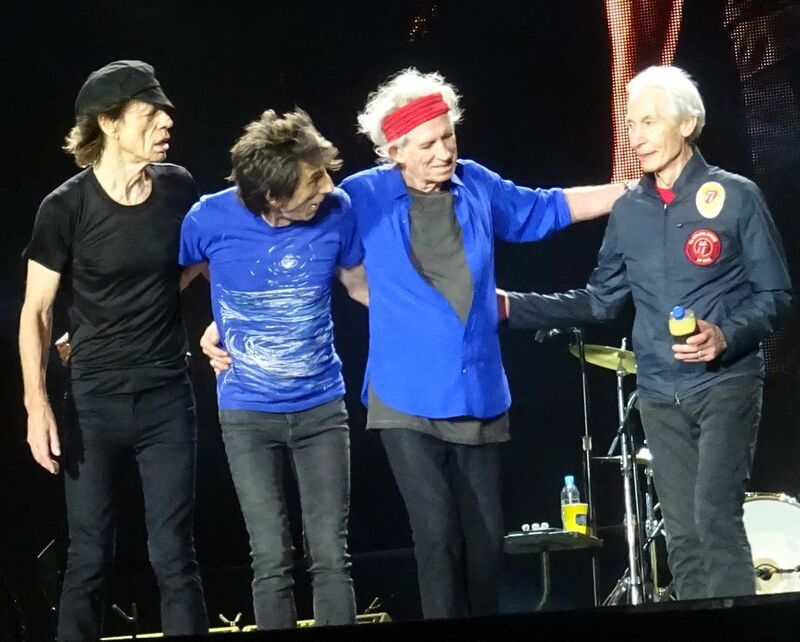 The Rolling Stones has let an indelible image here a legacy you can get older with dignity doing what you love and want if it makes you happy because you can be 70 and has a 20 years old spirit guy or you can be 20 without having interest of living. 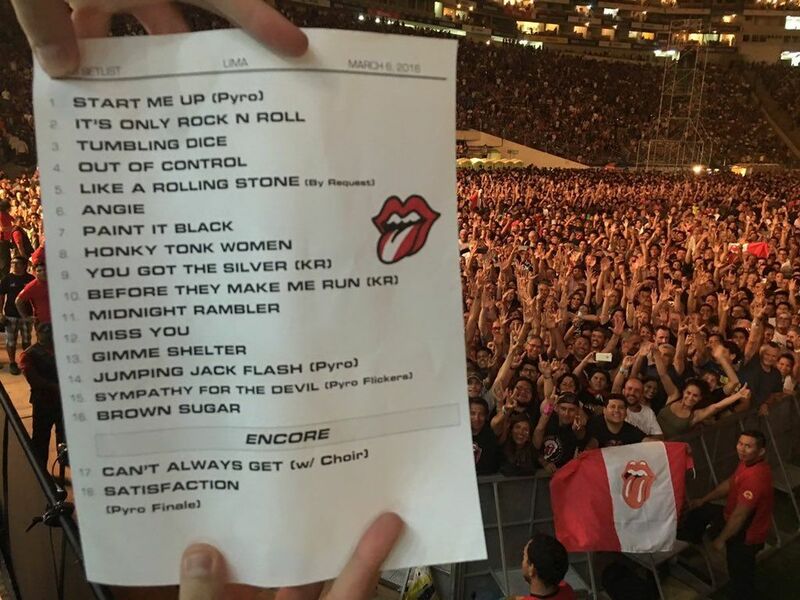 The Rolling Stones the best band in the world was in Lima Peru they were real not hologram not video or record very lucky the people who saw them and now some of them can say their grandsons about the historic night. Long live The Rolling Stones !!! Today I can barely stand. My body is a mess. 24 hours ago I was waiting in line to enter the Monumental Stadium, putting up with more than 30 degrees of temperature, drinking only water and taking care of my wife and son that were there accompanying me on this adventure. Even so, we could perceive a climate of euphoria in this part of the Lima district of Ate Vitarte. Everybody was happy walking to enter the concert, putting up with the severities of the weather as well, but sure that we would witness a unique event in our lives: a Rolling Stones concert. I saw them in Buenos Aires exactly 10 years ago, in the first of the two concerts that they gave during the summer as part of the A Bigger Bang tour. Those palpitations in the chest and that amazement that grows inside yourself when you hear the first chord of the first song are the main things I remember when I recall that concert. At that time, I thought that would be the only chance in my life to see the Stones live and I did all kind of crazy things to get to that concert. I enjoyed "Shattered" and "Worried About You" like crazy. Those are my favorite songs ever and at that time, they played them for me one after the other so I could keep them in my memory forever. Back then, I had no idea and I wouldn’t have bet that a decade later these charming men would be in my own country giving a concert and playing even better this time. At around 5 pm some cars with tinted windows appeared to enter the stadium, and as I approached my hair stood on when I saw that Mick Jagger himself was in there moving his hand timidly in a quick greet to the lucky ones who had the chance to look into the half-open car window. "Ese Jagger huevooonnn!!!!" cried an incredulous guy I didn't know, but who was as amazed as me to realize that our idol was just three meters away from us. The car left quickly and we returned to the queue. At 6 o’clock, we, the most desperate of the Area 2 were running in order to get as close as we could to the boundary fence. My friend Augusto Paredes had already posted on his Facebook account his first picture next to the stage, in the Golden zone. Many of you already know him: it is the same guy that almost fainted today, when he saw on this social network that Keith Richards himself had posted his picture with his sign "Keith, Peru Loves U". Augusto is the most genuine Stones fan I know and I'm sure no one but him deserves such honor. The guys from "Frágil”, the opening band, appeared right away and made a quick and direct show. The current vocalist is really gifted but Andres Dulude only has to move off his battered body for 10 seconds to get the public into his pocket. I recommend you to look for Frágil albums from the eighties or live. They are great. Punctually, at 9 o'clock the lights went out and we all lost our minds watching this amazing video collage. The stadium, contrary to the doubtful forecasts from previous days, was packed. The area in front of ours, the Field 1 was taken over and we were laughing thinking about how these guys there had paid almost triple than us just to be two meters closer. But like us, them, those in the east, west, north and the golden tribune went crazy when the lights went out and a powerful booming voice was heard throughout the stadium saying: "Ladies and Gentlema ...The Rooooolling Stoooones" and immediately the most crystalline riff you've ever heard of "Start Me Up" started. I don’t know if this is because I was there, but it was glorious for me. Keith Richards wore a colorful coat with Inca motifs or at least that’s what I think it was. I don’t know if it was a new design, but everybody talked about his coat and about how happy he was. 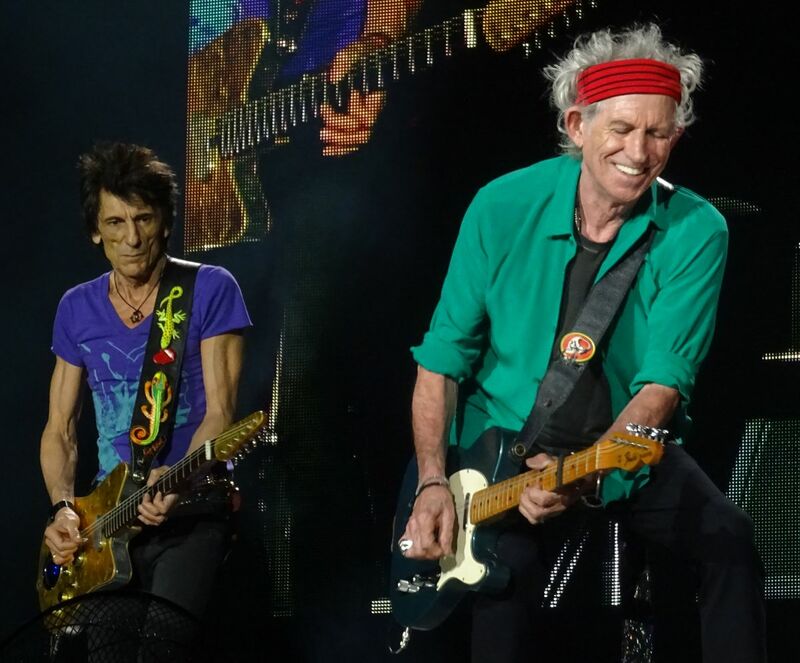 All the musicians attacked mercilessly: Jagger moving unstoppably, Keith doing the poses that we all love to watch while he was focused on playing his riffs, and Ronnie with that impeccable level that everyone is talking about on this tour. Charlie hitting everything like a clock. Keith’s guitar solo in "It's Only Rock'n'Roll" was 20 seconds of overflowed emotions that there is nothing on earth that can be comparable to it. And we still had two more hours of the concert!!! “Hola Lima, hola Perú, hola mis causitas”... these innocent words were enough to win the public that appreciated the effort of the leader to approach the multitude with those details. When Ron took his turn to do his part in "tumbing Dice" it was the confirmation of his high level on this tour. I was overjoyed to see Keith and Ron’s faces grinning from ear to ear watching the reaction of the public singing the chorus with all its might. Even in "Out Of Control" an unknown song to most people. When the turn of "Like A Rolling Stone" came it was madness: the guys who were close to me were screaming, begging that it was that song. Honestly, any of the four were good for me. I enjoyed it like crazy screaming "How does it feeeeeeel" with the entire ecstatic stadium. Mick's harmonica sounded impeccable and I approached as much as I could to see him making his solo. Impeccable version. Some days ago, friends and I said, "hopefully they don’t play Angie" among the songs to vote for. “We’ve heard enough of it” that was our explanation. As soon as we saw that Keith grabbed an acoustic guitar and heard the first chords of the biggest hit of "Goats Head Soup", I almost started crying like a child. It was an unexpected jolt. It was an amazing version chanted throughout the stadium, I was so proud I wanted to tell these musicians that for those 50,000 people, this performance was an incredible moment in their lives. Right now, I'm already looking for some live version of Angie to try to repeat the experience. "Honky Tonk Women" was a total joy, from the first blow of the bell. All the guys had already cast their eye on the new backup singer, Sasha, moving deliciously next to Bernard. The wind, as always, was heating up the song. 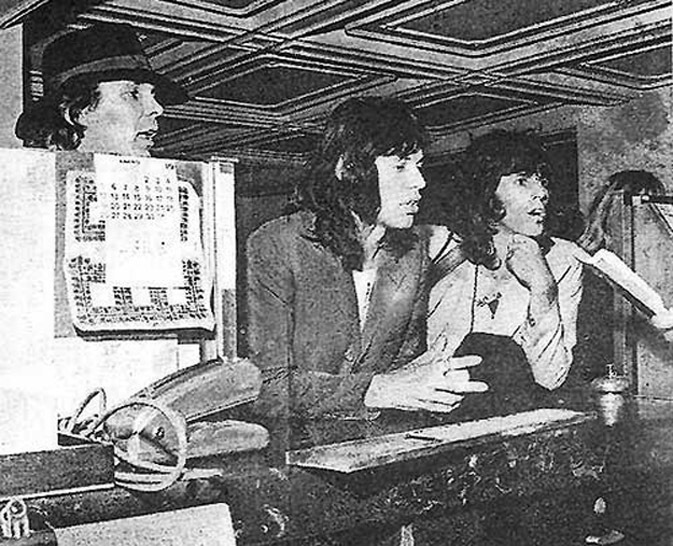 "The food here is great ... the best of South America..." Jagger knows how to get the public to his pocket even with gestures after saying: "you sing better than your neighbors” or "How cool Lima is”. "You Got The Silver" was the gem that most knowledgeable fans will thank forever, and during "Before The Make me Run" it got clear that Ron and Keith are the funniest rock'n'roll guitar players. Those solos intertwined at the end of the song were pure gold. The super long version of "Midnight Rambler" was for these musicians to show what they really are: Ron surprising everybody with those sharp solos and endorsing the song at the same time, Keith playing blues with the heart, Charlie keeping the rhythm to the limit and Mick moving his body like crazy and amazing the younger audience that saw how a 72-year-old guy had a full stadium totally in the palm of his hand. 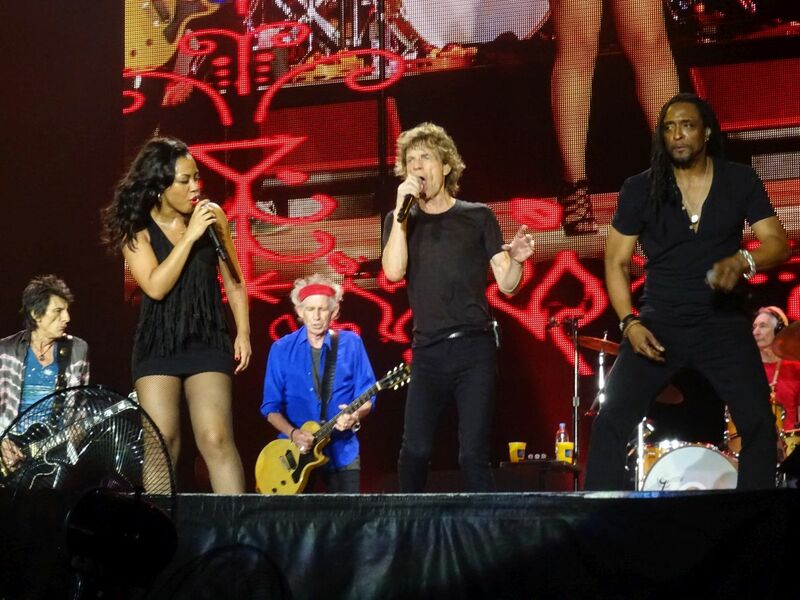 Sadly, I didn’t see any version of "Gimme Shelter" on this tour, so there was no surprise that I hadn’t seen before. However, it was rather surprising to realize that Sasha is not only very beautiful, but she also makes a very good duet with Mick without copying previous versions. She showed all the power of her voice and we all loved this version. By the way, I must say that Keith's guitar in this song sounds better than in previous tours, he is in great musical shape. The last songs were a real feast: the sax player that replaced Bobby Denson- Karl made his own version of "Brown Sugar" standing out notoriously; he is quick and effective. At this point, and after "Jumpin", our bodies were already feeling the punch. We jump and scream gladly but it’s also exhausting. The images during "Sympathy" were crazy, Keith playing his solo greatly and a full stadium screaming "huuu uh uh! Uh uh huuu!” was fantastic. The chorus "You cant always get..." imbued with the musicians and Ronnie again standing out. We were at the end with "Satisfaction" and the fireworks and everybody jumping around until someone complained and we stopped while laughing. 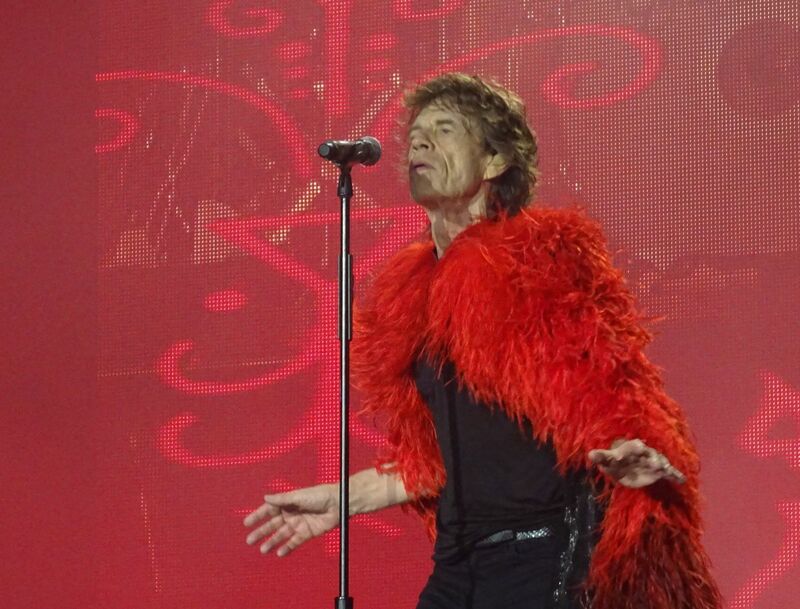 With the jumps and shoving I didn’t get the chance to see much details of the guitar solos or Jagger’s dance moves ... only until the end when he approached the runway and I tiptoed again to see Mick closer, for the last time. And it was over. It was fast and powerful. Everybody was amazed and completely grateful. The best concert that many of us have seen and that will never see here in Peru. Thanks Mick, Keith, Ron and Charlie ... all the musicians. Everything that we witnessed on Sunday until 11p.m. was really worth it. Two hours that will make us smile when we remember them at an old age. Being a fan of the Rolling Stones is the best thing that could have happened in my life. Just with a headset, a video, a story told with friends or with the memories of what I lived in a concert; everything has given me countless opportunities to be happy. Thank you Stones and see you next time.